Australia’s tropical outback – The Top End – is a wild land where Brolgas fly across the sunset, huge crocodiles laze on riverbanks and sandstone shimmers with the world’s oldest art. Feel the timeless peace of a landscape full of animals and very few people. Wake to the manic calls of flying-foxes and cockatoos, look out across a billabong filled with water-lilies, walk on rocks created 600 million years ago. 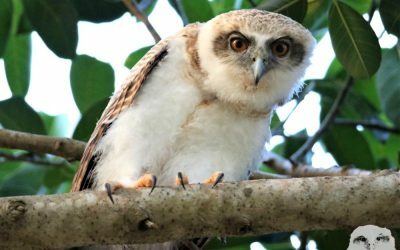 Wild Top End wildlife tour of the Northern Territory is a special journey created for curious adventurers who love wild places and wild creatures. Get to know Kakadu and Mary River National Parks including some of the lesser-known walks and rock art sites. 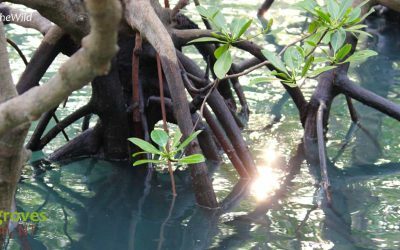 Learn about Top End wildlife on this tour, and help protect them. (NB: accommodation upgrades are available upon request). 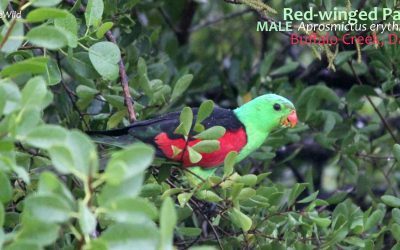 Our Wild Top End 6 day wildlife tours only run on the set dates shown, although for private parties we can arrange other dates around July, August & September. If you wish to travel to this magnificent region at other times we highly recommend Lord’s Kakadu & Arnhemland Safaris. Tour Leader: your guide will be one of our Level 4 (highest level) Echidna Walkabout Wildlife Guides who has also completed an intensive “Kakadu Knowledge for Tour Guides” course overseen by the Australian National Parks Service and by Local Aboriginal People. 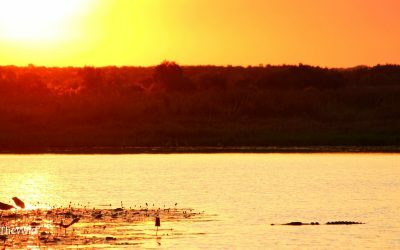 Includes: wildlife guidance throughout, 5 nights accommodation, all meals from lunch Day 1 to lunch Day 6, air conditioned transport, wetlands cruise on Mary River. 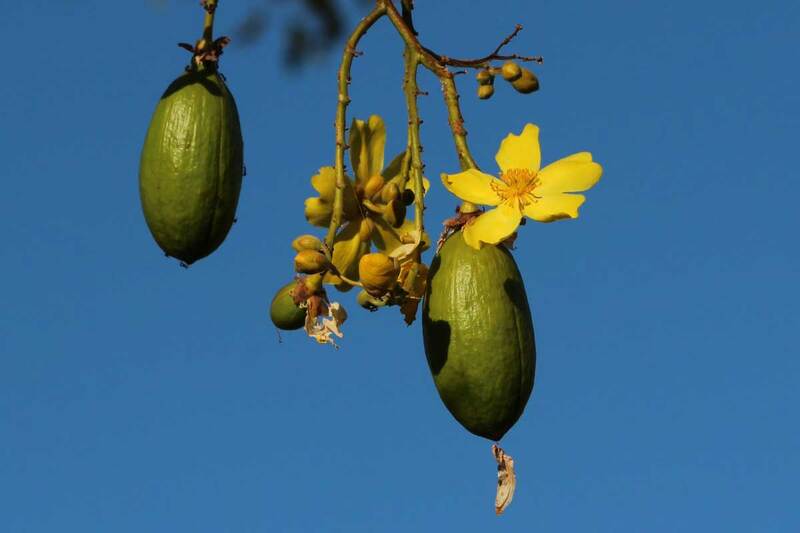 We offer a FREE introduction to Darwin and the Top End on the afternoon prior to your tour. You can also join us for dinner that evening. Please see your itinerary of Information Sheet for more details. PLUS, if you are going to Darwin a few days before the tour, or staying after here’s a few things you can organise yourself…..
Sea Darwin arranges special afternoon/evening boat trips across Darwin Harbour to look at turtles nesting. This brilliant trip is run by a respected company and includes dinner. 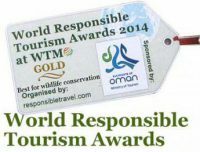 5% of the cost of the trip goes to turtle research. To fit in with nesting cycles around high tides this trip runs according to lunar cycles ie. new moon and 5 days after. Sea Darwin also run other trips – check out their website for more information. Deckchair Cinema There is nothing like going to the cinema under the stars and Darwin is a great place to do it. The wonderful thing about this place is that you can also have dinner and a drink at the cinema before the film. Highly recommended and lots of fun. You can book online. Darwin started life as a remote colony and its early colonial buildings are wonderful. You can view the beautifully old Administration buildings (and some of the newer buildings) on a walk along the Esplanade on the south-eastern side of the city. One of our favourite places in Darwin is the Museum & Art Gallery of the Northern Territory located here. It has exceptional displays of Aboriginal culture and art and you can get a great overview of the natural history of the region. The Mindil Beach Sunset Market is legendary in Darwin. Great food abounds so have dinner while you are browsing​. Provenance Arts Gallery has a magnificent collection of Aboriginal Art, jewellery, clothing and books. The gallery is 100% Aboriginal owned, and a social enterprise. We highly recommend a visit. Complete your holiday with big kangaroos, wombats, koalas and parrots! The Wild Top End tour connects seamlessly with our 4 day Mungo Outback Journey, and/or 4 day Wildlife Journey – both provide a whole new suite of wildlife. The Mungo Outback is at its best in August/September, and the weather is sunny and mild. 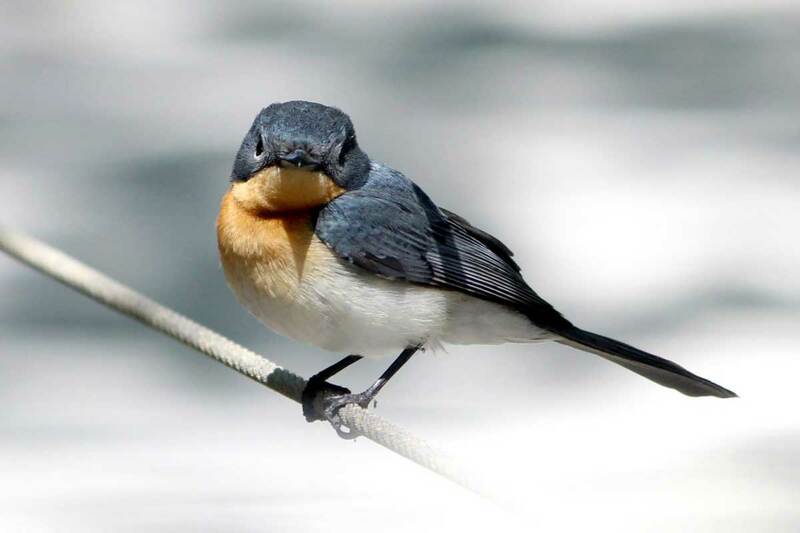 The Wildlife Journey is best for wildflowers and birds in September. Good walking shoes or boots that completely cover the feet (sandals are good to have but are not recommended for all walks), outdoor clothing to suit variable weather conditions (please check weather forecast for accurate predictions), sun hat, rainproof coat, insect repellent, 15+ sunscreen, small torch (flashlight), daypack and 1 litre re-usable water bottle. Camera and binoculars are recommended. As space is limited please keep luggage to 1 duffel bag OR 1 backpack OR 1 small suitcase per person. Drinking Water: Tap water is completely safe and drinkable and available at both accommodations on this tour, and a large fresh storage is carried on board the vehicle each day. We recommend you bring a re-usable water bottle which we can refill during the day. If you don’t like to drink tap water we highly recommend you bring a filter to reduce plastic waste. Bustards, Water Pythons, Antilopine Kangaroos, Dingoes, Red-tailed Black-cockatoos…. 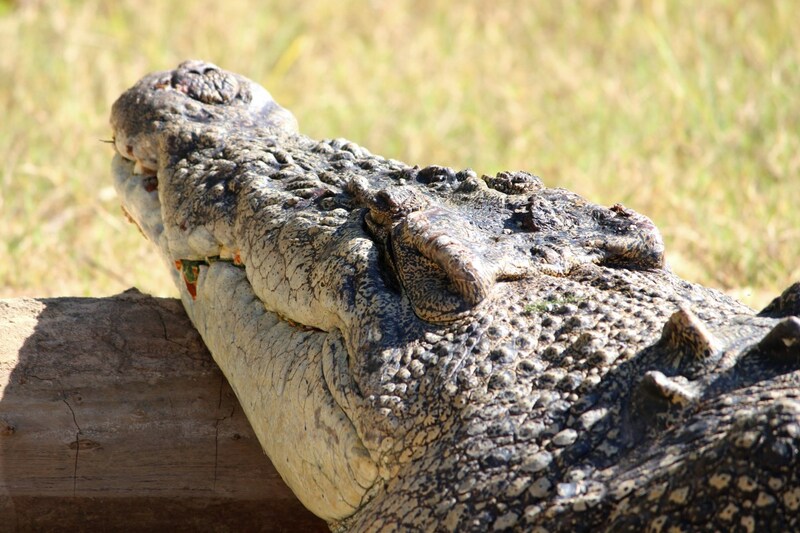 this wildlife tour of the Northern Territory sees some spectacular wildlife. I’m a Dingo: don’t call me a dog! 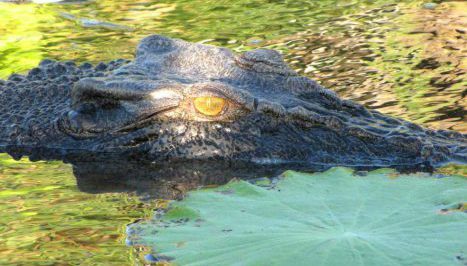 Your Wild Top End Northern Territory wildlife tour departs from your accommodation in Darwin, taking 6 days to explore the wildlife and flora of Kakadu National Park, the tropical rivers of the Top End, and the grassy plains and billabongs of Mary River National Park. Tour returns to Darwin. After an early pick up from your Darwin accommodation we’ll head eastwards into the tropical outback. The road from Darwin to Jabiru is sealed for its entire length and makes for very easy traveling. 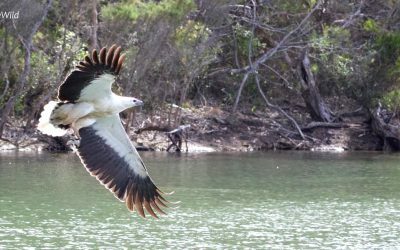 On the way we’ll stop at a number of beautiful locations including famous Fogg Dam (part of the Adelaide River floodplain) where we’ll take our first walk into a monsoon forest and view some of fantastic birdlife and wildlife of the Northern Territory. Then we’ll get on our way crossing a number of the huge rivers that drain the tropical wilderness including the Mary River where we might see our first crocodile. We enter Kakadu National Park and stop at Mamukala Wetland and take a walk to get our first taste of the tropical wonders of Kakadu. We’ll end the day in the small town of Jabiru and move into our accommodation. (staying here 3 nights). Accommodation: Anbinik Jabiru (tonight and 2 more nights = 3 nights total). Our price includes wonderful Double or Twin Share accommodation in Bush Bungalows with external bathrooms (private to you). You can upgrade to a private cabin (en-suite) – contact us for more information. Potential wildlife sightings today: Fogg Dam and Mamukala Wetlands are famed for waterbirds including Brolga Crane, Glossy Ibis, Magpie Goose, Black-necked Stork (Jabiru), Wandering & Plumed Whistling-ducks, egrets, herons, pratincoles and many more including finches, herons, raptors & honeyeaters. We may see crocodiles, pythons, lizards, dragonflies and butterflies. 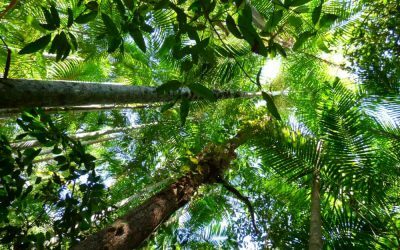 Vegetation varies from savannah woodlands to monsoon rainforest and wetlands. Aboriginal Heritage, black kangaroos, red winged parrots, sunset at Nawurlandja. The Nourlangie region will be our first access to the magnificent Arnhem Land escarpment and its unique wildlife. It also helps us to understand the enormous importance of Kakadu to the Aboriginal People. Ancient sandstone ranges rise directly out of the Kakadu floodplains in a landscape that epitomises the Dreamtime in Australia. We’ll visit a number of places in this region including the Nanguluwur Rock Art site, Anbangbang Billabong and Nourlangie Rock Art site – this last site contains some of the most powerful Aboriginal paintings in Australia including a depiction of the Lightning Man. All the names in Kakadu rise from Aboriginal languages. You will begin to feel the incredible power of this landscape. After a picnic lunch we’ll head back Anbinik for a siesta (or a swim in the pool) during the heat of the afternoon before heading back out to the bush to watch the sunset over the Kakadu escarpment from Nawurlandja lookout. Twilight often heralds the flight of tens of thousands of fruit bats winging their way silently through the tropical dusk – an incredible sight. We then return to Jabiru for dinner Accommodation: Anbinik Jabiru Meals: Breakfast, Lunch and Dinner Potential wildlife sightings on tour today: our walk to Nanguluwur early this morning can yield an incredible array of bush birds ranging from tiny finches to the large Red-tailed Black Cockatoo. 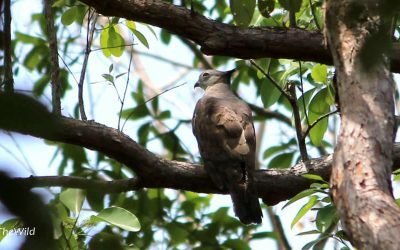 Rare Chestnut-quilled Rock Pigeons may come to drink at a small spring near the rock art site and we may see Partridge Pigeons and Red-winged Parrots. 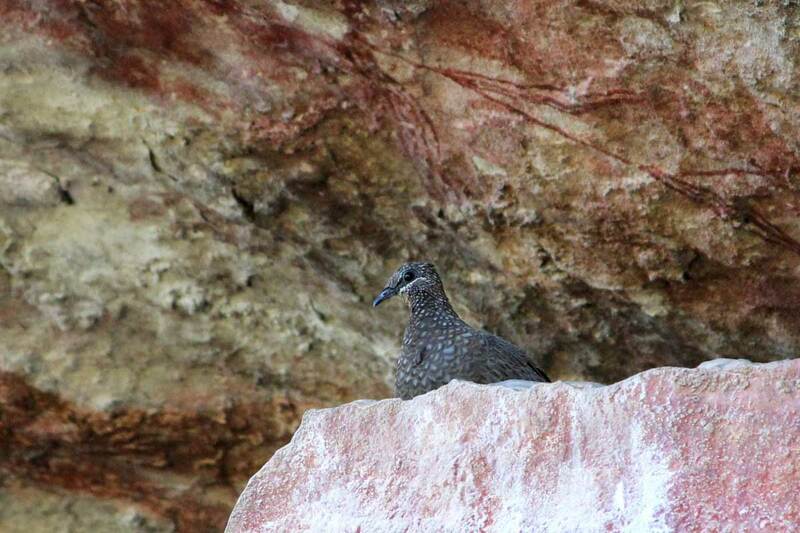 At Nourlangie we often see Emerald Doves and sometimes Sandsone Shrike-thrush. 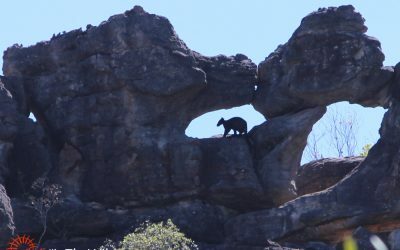 A highlight of this locaton may be the sighting of Black Wallaroos, a localised mid-size kangaroo unique to this region. Anbangbang Billabong is host to a myriad of waterbirds, many species of water lilies and Estuarine Crocodiles (in 2014 we watched a crocodile hunt and kill a pelican at this location). The fruit bat fly-out in the evening has to be seen to be believed. Morning at Ubirr – East Alligator River. Afternoon at Iligadjarr Wetlands – South Alligator River. Many who visit Ubirr come away as different people. It is possibly the most beautiful place in Kakadu with some of the most compelling wilderness landscapes on earth. It has a presence that takes humans back to their beginnings. Nearby the tidal (saltwater) section of the East Alligator River bounds the vast Aboriginal lands of Arnhem Land – to go any further requires special permission. But on the Kakadu side there is a wide variety of activities to choose from including gentle walks near the river, views of elaborate Aboriginal Rock Art sites or a climb to the top of Ubirr Rock with its stunning views across Kakadu. We’ll also take the Bardedjilidji Sandstone walk which take us deep into some of Kakadu’s most remarkable geological formations where we learn how the Kakadu Escarpment was formed millions of years ago. During the heat of the day we’ll return to Jabiru followed by a rest then a refreshing swim in the pool before heading back out in the afternoon to the nearby Iligadjarr Wetlands for a walk in a tropical savannah woodland beside the freshwater floodplain of the South Alligator River. Accommodation: Anbinik Jabiru (last night here) Meals: Breakfast, Lunch and Dinner Potential wildlife sightings today: The Ubirr region is one of the few places where it is possible to see the dainty Short-eared Rock-wallaby. There are also occasional sightings of the Black Wallaroo. Estuarine Crocodiles are common in the East Alligator River and surrounding billabongs. Some special birds are the Blue-winged Kookaburra, Brolga, Pheasant Coucal and Peaceful Dove amongst many others. The Iligadjarr Wetlands are a total contrast to Ubirr and on a different river system. We walk through a tropical savannah woodland at the head of the South Alligator River floodplain. Water birds and raptors abound on the surrounding wetlands, Rainbow Bee-eaters hover overhead, Jabiru Storks (Black-necked storks) and Brolga Cranes are often seen with occasional sightings of water monitors, pythons and crocodiles (from a safe distance). This walk is often one of the wildlife highlights of our Kakadu trip. Optional tour today: Aboriginal guided boat tour out into the wilderness of the East Alligator River. This 2.5 hour tour is remarkable; it follows the river upstream beside brilliantly coloured sandstone escarpments and provides a full commentary by a local Aboriginal guide about the significance of Arnhem Land to Aboriginal People. The highlight of the trip is the opportunity to take a walk on the east side of the river onto Aboriginal land – normally this would require a special permit so this is a very special experience. The tour costs approximately $80 for an adult with discounts for children. For more information please check out Guluyambi Cultural Cruise. Into the vast Mary River catchment: Jabiru to Point Stuart Wilderness Lodge. Today we travel westward out of Kakadu to Point Stuart Wilderness Lodge beside Mary River National Park. Our route takes us firstly along the paved Kakadu Highway then onto the dirt roads heading north into Mary River National Park. On route we’ll stop at a number of special little places, visited by few, but very beautiful. We sometimes see Dingoes and the elusive Antilopine Kangaroo. We’ll finish up at Point Stuart Wilderness Lodge, check in, cool off in the pool, then take a peaceful walk through Jimmy Creek rainforest right beside the Lodge. 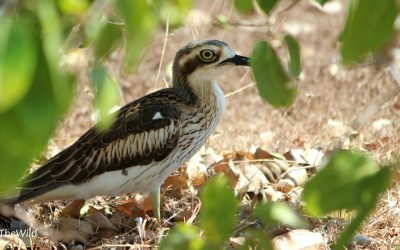 Here you’ll see the huge nesting mounds of Orange-footed Scrub Fowl – a bird the size of a chicken that builds nests up to 3 metres high! The grounds of the Lodge abound with the beautiful little Agile Wallaby. Cockatoos and parrots of various species abound. Overnight at Point Stuart Wilderness Lodge (there is a swimming pool at the lodge and a saloon bar). 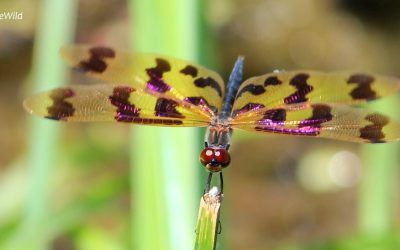 In the afternoon you will experience some of the ultimate magic of the Top End with a special driving and walking tour beside two magnificent billabongs deep in the bush on the vast Opium Creek private reserve. Accommodation: Point Stuart Wilderness Lodge (tonight and tomorrow night = 2 nights total) Meals: Breakfast, Lunch and Dinner Potential wildlife sightings today: Agile wallabies abound in the Mary River catchment and this is one of the best places to see the largest kangaroo in the Top End – the Antilopine Kangaroo which moves around in small family groups through the endless savannah woodlands. 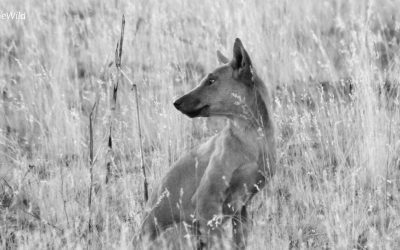 Dingoes regularly roam the savannah searching out prey and carrion. Opium Creek is a refuge for the Australian Bustard and the Brolga. The Rose-crowned Fruit-dove is often heard and occassionally seen in the monsoon forest and the Pied Imperial-pigeon often bursts out of the forests canopies. Hundreds – and sometimes thousands – of Little Corellas fill the trees during the heat of the day and come down to feed and drink in the evening. One of the most unusual and spectacular birds in this area is Channel-billed cuckoo, a very large cuckoo which is most often see hurtling across the sky at high speed. Crocodiles in the Wild in a wetland wilderness. Today after an early breakfast we head out into the bush before sunrise for our last special Northern Territory wildlife walk at Bird Billabong in the Mary River National Park. This large wetland – unlike any others we have visited – is nestled beside Mt Bundy Range, an ancient granite outcrop in the middle of the Mary River catchment. Thousands of birds move to this billabong as the surrounding country dries after the monsoon season. Every conceivable species of bird move across the water in huge multi-species skeins fishing and squabbling. 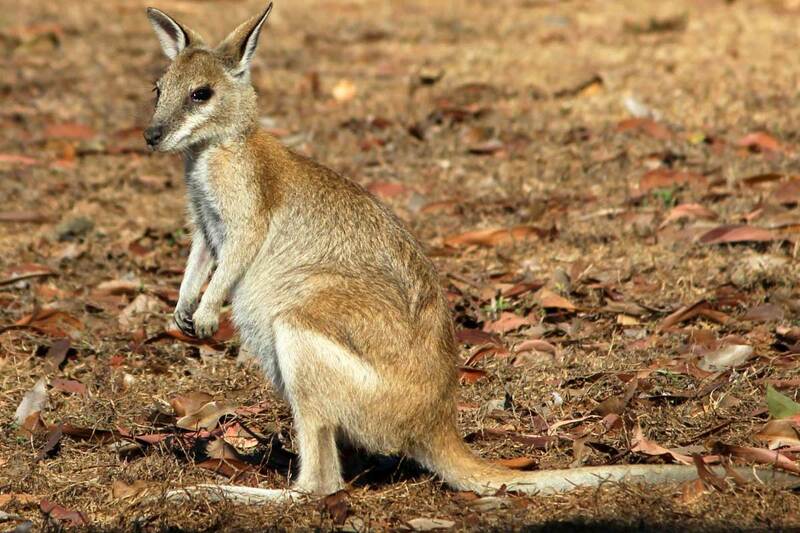 The surrounding savannah is home to hundreds of wallabies that appear at every turn of the walking track. Raptors regularly visit in search of prey, creating havoc as they fly over the wetland. This is one of the wildlife tour highlights of the Top End. After a relaxing morning walk we’ll depart to Darwin having lunch on en-route. You will be dropped at your accommodation in Darwin OR we can arrange transfers to Darwin Airport if you are flying out today. Suggestion: stay overnight night in Darwin and check out some of the fabulous Aboriginal Art Galleries in town. We recommend Provenance Arts. Next day, fly direct to Melbourne, stay one or two nights, then join our Mungo Outback Journey tour and see the parrots and Red Kangaroos of the Outback. Potential wildlife sightings today: even if you have only a mild interest in birds, Bird Billabong is spectacular. This wetland often contains huge numbers of whistling-ducks (both Plumed and Wandering), Spoonbills, Ibis, Magpie Geese and Pygmy Geese amongst many others. Jabiru often appear. Great Bowerbirds build their bowers in the nearby grasslands and are often seen and heard around the billabong. Near the granite range we often see the elusive Black-tailed Treecreeper and have also seen the northern form of the Southern Boobook owl. A variety of finches are also seen in the grasslands.